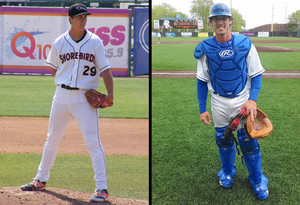 (York, Pa., April 10, 2019) - The York Revolution continues to load up its preseason roster in advance of the start of Atlantic League Spring Training next week, announcing two more player signings as right-handed pitcher Matthew Grimes and catcher Corey Bass have both been added. The signings were announced by manager Mark Mason live on Tuesday’s episode of “Revs Hot Stove Weekly presented by Shipley Energy” on SportsRadio 98.9 FM & 1350 WOYK. Grimes joins the Revs for his sixth pro season, having spent his first five years in the Baltimore Orioles organization, reaching the Triple-A level with Norfolk last season. The 6’5 righty was an 18th round draft choice of the Orioles in 2014 out of Georgia Tech, and is 27-31 with a 3.94 ERA in 116 outings (80 starts) for his minor league career. Grimes was a 10-game winner for Delmarva in 2015 and combined to win 11 games between Frederick and Bowie in 2016. The Hoschton, GA, native was a Carolina League Mid-Season All-Star selection that season and the Orioles Minor League Pitcher of the Month in May after winning four consecutive starts, part of a five-start stretch that extended into June, during which he allowed just one run. The 27-year-old was a fourth-round pick of the Chicago White Sox out of Mill Creek High School in 2010 but opted to attend Georgia Tech. He was selected by the Philadelphia Phillies three years later but again remained with the Yellow Jackets before the Orioles came calling a year later. Bass joins the Revs for his sixth pro season and first in the Atlantic League. A native of Orlando, FL, the 27-year-old was selected by the Phillies out of University of North Florida in the 20th round of the 2013 draft. Bass spent parts of three seasons in the Phils’ system, and after a year in the American Association, landed with Windy City of the Frontier League, where he belted a career-high 11 home runs and was an All-Star starter in 2016. Known as a strong defensive catcher, Bass threw out 44 percent of attempting base stealers that season, the league’s highest percentage in four years. Bass earned a contract with the Miami Marlins organization in 2017 before returning to Windy City and spent last season working on a possible transition to pitching. The Revs now have 26 players signed for the 2019 season with Atlantic League Spring Training set to begin next week. The York Revolution Professional Baseball Club is a member of the Atlantic League of Professional Baseball. The Revolution were Atlantic League Champions in 2010, 2011, and 2017. The 2019 season is the team’s 13th. Located at 5 Brooks Robinson Way, PeoplesBank Park hosts all 70 home games, in addition to myriad events through the entire calendar year. For tickets or more information, please call 717-801-HITS (4487) or visit the Revolution online at www.YorkRevolution.com.